It’s finally starting to feel like fall outside here in Springfield, IL and it is beautiful. This morning, some of the music therapists at MTC and I decided to have a trip to the pumpkin patch for some fall fun. Also, I’ve never been to a pumpkin patch where you cut your own pumpkins, so it was a neat experience for me as well. It was a nice break from work and internship life. However, after returning home from the pumpkin patch, I realized that I haven’t been great at practicing self-care recently and my body can definitely feel it; this week, I have been exhausted all the time and there isn’t a good reason for it either. I’ve noticed that I’ve been preaching self-care to my parents, friends, and sometimes even to my clients, yet I haven’t been practicing it. So this afternoon, I’ve come up with some ways that I will better practice self-care in the upcoming weeks in order to eliminate stress, take care of my body, and keep myself energized. Stressing eating isn’t a good thing and it’s important to have a balanced meal as well. As I’m quickly learning from those around me, eating six small meals a day is better than eating three big meals, so I’m going to pack better, healthier snacks that I can nibble on throughout the day to keep my energy up. Go to bed at the same time every night…no matter what! Recently, I haven’t been going to bed early like I did at the beginning of my internship. This needs to happen because sleep is extremely important in order to process through what happened that day. Throughout these upcoming weeks, I will go to bed at the same time every night and try to wake up at the same time each day as well. It’ll be hard because there is always something to do, but sleep is SO important. I dislike exercising. However, it’s a great way to unwind and eliminate stress. So from now on, I promise to at least try to exercise in a way that I like at least two to three times a week. As therapists, we love working with others, but we often forget to help ourselves. Self-care is hard to practice, but it is the most important thing to do each week. If you’re an current music therapy intern, or even a professional or student, and have been struggling in the self-care area, let’s try this together! Finally, follow me on live video every (or almost every) Thursday on Music Therapy Connection, LLC’s Facebook page. I will be answering questions, sharing songs, and discussing other topics as well! If you have a question or want me to talk about something, please let me know! It’s that time again!! We are in the process of putting together materials for our new music crate and class package. That means new songs, new materials, and new stories are coming your way VERY SOON!! I love creating new materials to share, but like everyone else I often struggle with the process of getting started. That’s why I want to share 3 quick songwriting tips and reveal the best time for writing new songs. 1. Let It Flow – One of my favorite things to do when writing new material is simply write everything down or record it all! That means writing down or recording, with no filter, every single word that pops into my head in the moment. It may not be perfect on the first try, but I can almost guarantee at least a new idea, a good line, or an awesome melody will come from just getting letting go and letting it flow. 2. Ask the “w” questions – Ask yourself the who, what, when, where, why questions when your are writing or refining your song. Who is this for? Why am I writing this? What is the purpose? By answering those questions, you can sometimes spark new ideas or stumble upon all new material. 3. Write it Now, Revise Later – If you are feeling unsure of your song or lyrics or feeling stuck, write something down. OR record something, anything. Then walk away. Physically walk away and do anything else that will consume your mind and take you away from the song writing process. Come back with a clear head and try again. So, when is the best time for writing new songs….?? NOW and whenever you feel any little spark of inspiration. The more you write the easier it gets. The more ideas you have stored away, even in small, 5 second, snippets or single lines of lyrics, the more you have to pull from in the future. My favorite song ideas often hit when I’m least expecting it so I quickly pull out the nearest piece of paper and write down the idea or open the voice memo app on my phone and make a quick recording or note to self that I can easily return to later. I’d love to hear more of your ideas on what helps you create new content. What is your favorite time to write new songs? Do you have any tips to share on your songwriting process? This week has been crazy (in a good way of course)! I’ve started to lead more in all of my sessions here at Music Therapy Connections as well as at the hospital and I’ve been pushed out of my comfort zone so many times. From these experiences, I’ve learned that there are some things that I should’ve practiced more during college that would have made my life a little easier now. Building a HUGE knowledge of repertoire. Typically, I only learned the music that I needed to learn for my practicum sessions. It wasn’t until this summer that I started pushing myself outside of the popular music realm and now I’m quickly realizing how important it is to know songs from each genre and decade of music. At the hospital, I meet with a lot of families and patients who have such a wide range of music preferences and I should at least be able to talk about or play the music they love the most! However, it’s literally impossible to learn every piece of music ever written, but having a general knowledge of a few famous bands or knowing how to play a few hit songs from each decade will be extremely important. Also, for current music therapy students, learn the National Anthem. You will never know when someone might ask you to play it. In general, it’s also just a great song to know. Practicing playing in different styles. Just like having a huge knowledge of different repertoire, it’s important to be able to play in different styles. Again, it wasn’t until late last semester and this summer that I started picking on the guitar and playing different songs with contrasting styles. I have started practicing simple songs such as “Twinkle, Twinkle” (or any simple song that I know the chords to really well) and trying to play it in different styles. This has helped me tremendously and something that I wish I had started practicing sooner. Practicing the things that scare me the most. Public speaking scares me. My brain gets all the words jumbled up whenever I have to give a presentation or talk to someone I don’t know. However, as a music therapy intern transitioning to a professional, I’ve had to talk to so many different people. I wish that during college I had pushed myself out of my comfort zone and talked to new people instead of avoiding it. We’re asked every day what music therapy is so oral communication skills as well as people skills are extremely important. One way that I am practicing becoming more comfortable talking to people is by striking up conversations with new people I see throughout the day such as having a quick chat about someone’s day in the line at Meijer. That being said, find something that scares you and face it head on every day! Even though I did practice these things before my internship, I should have challenged myself even more. Thankfully, I am in an environment where I can challenge myself everyday to learn these skills, grow, and continue pushing myself outside of my comfort zone so that I can continue to effectively transition from a student to a professional! 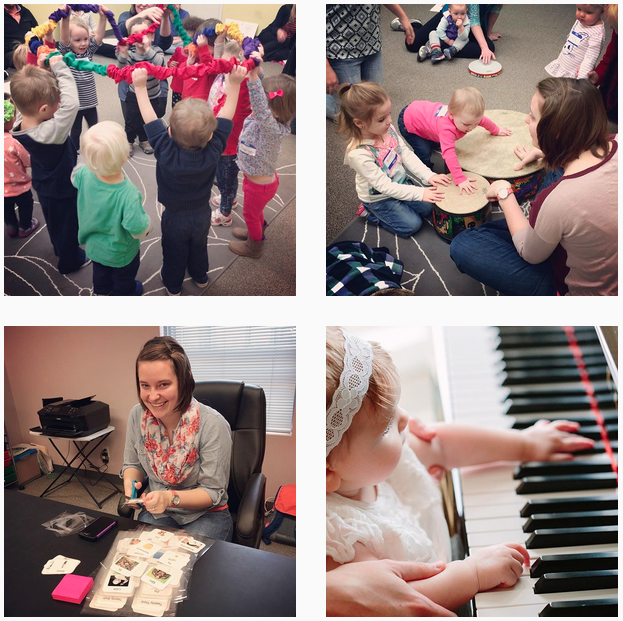 As we wrap up another awesome week of music therapy at MTC, I wanted to tell you a little more about how we’ve been advocating for music therapy this week. If you follow our Facebook page, you’ve probably heard that it’s Illinois Music Therapy Week. To celebrate, we are working even harder to put out the word about music therapy. On a weekly basis, Rachel and I record live videos on Facebook with songs, resources, and ideas for music therapists, students, and teachers. This week we covered the topic of being an advocate by simply talking to anyone and everyone about music therapy and getting out in the community. Whether it is the chatting with a cashier at Walgreen, informing the doctor in a hospital, answering your waitress’ question at lunch, speaking at a community event, having coffee with a friendly neighbor, etc, the more people you talk to about music therapy, the more word spreads and curiosity grows. Think that for every one person you tell, they possibly tell another five, ten, or a dozen people. We also challenged our intern, Sammy Springer, to share her own definition of music therapy and how she is becoming more of an advocate every day. She explains in her video the importance of having an elevator speech and being able to be concise in talking about music therapy. On top of everything else this week, we had the incredible opportunity to be featured on our local news! What says advocacy more than the words MUSIC THERAPY being said or shown on the local news multiple times!!!! What a blessing and a joyful moment in our week. We hope to see you advocating for music therapy and are always happy to answer any of your questions! Happy Illinois Music Therapy Week! It’s Music Therapy Advocacy Week here in Illinois, so we are upping our game when it comes to spreading the word about our work and the power of music therapy. In addition to making appearances in community publications and on our local news this week, we also wanted to share some of our favorite resources for becoming an expert advocate. There are MANY ways to step up to the plate in this arena, so do what works for you! Here’s a quick roundup of articles, videos and podcasts on the topic of music therapy advocacy.